We had a small get together this weekend with some friends and family and Kim and I made a three course dinner which included banh xeo (Vietnamese Sizzling Crepes) and a duo of dishes from chef David Chang and his famous Momofuko Ssam restaurant–marinated steak ssam (Korean for any meat wrapped in lettuce or other leaf vegetables) and steamed pork belly buns. We threw this party together pretty quickly–Kim wanted to make banh xeo (Vietnamese sizzling crepes) and the other dishes were incidentally inspired from reading a review of David Chang’s new cookbook, Momofuku from the Wall Street Journal during a flight back from Austin last week. Even though I lived in NYC for a year, I actually never heard of David Chang until recently (yes, we’re late foodie bloomers) and now his popularity is through the roof. 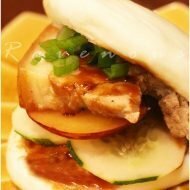 So we decided to test his marinated steak ssam recipe and recreate his steamed pork belly buns based on what’s available on the web. We only had 3 hours to shop and cook for 8! It actually felt like a top chef challenge…but we did it and we’ll present the dinner in three separate posts. First up, the marinated steak ssam. This calls for using skirt or flap steak, but we we saw london broil for only $1.75/lb vs. $ 7/lb for the skirt…and it looked rather flimsy so it was easy decision and the only item that we bought the night before to marinate. The accompaniments below can all be made ahead of time. Combine all ingredients and marinate the steak in a ziplock bag overnight. 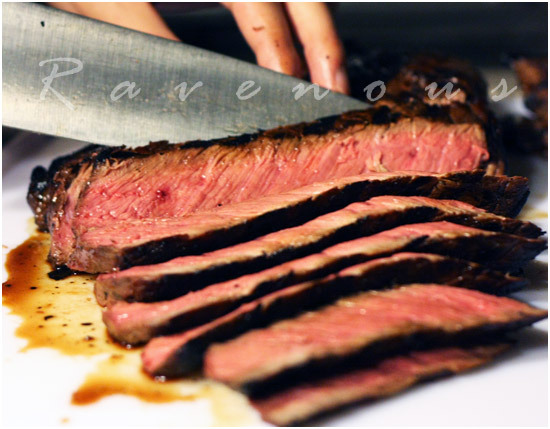 Grill to desired level of doneness–nothing but medium rare for our tastes. Always allow the meat to rest for at least 5 minutes. Cut against the grain on a diagonal. Then cut into smaller bite size pieces and transfer to serving dish. Kim’s future brother in law did a great job on manning the grill! Look at that perfect pink center!!! Combine all ingredients in a bowl and allow the flavors to incorporate in the fridge for about 20 minutes before serving. Our guests loved this sauce and left nothing behind! To eat, take a piece of lettuce and perilla leaf together and dab on some kimchee puree. Place a few small pieces of steak in center and top with plenty of ginger scallion sauce and caramelized onions. Wrap, bite, and be prepared for a flavor packed explosion! 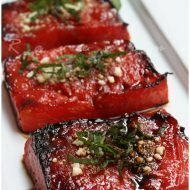 The marinade was solid, but to be frank, the overall layering of flavors is what makes this style of eating great so even just some salt and pepper on steak would have been fine. 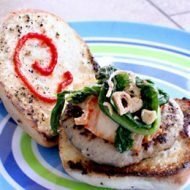 The ginger scallion sauce is definitely a winner and can be used for so many other things as well. Overall, it was a great new experience of eating Korean style ssam for all of us. Stay tuned for the banh xeo recipe and our version of Momofuku steamed pork buns! There was a review of his book in Gourmet too and it did entice me to buy it, but I'm a bit torn because he doesn't allow photos in one or two of his restaurants and thinks it's stupid that bloggers want to take pictures. That's also why I haven't been to any of his restaurants yet. the steak is cooked to perfection!!! lucky guests!! 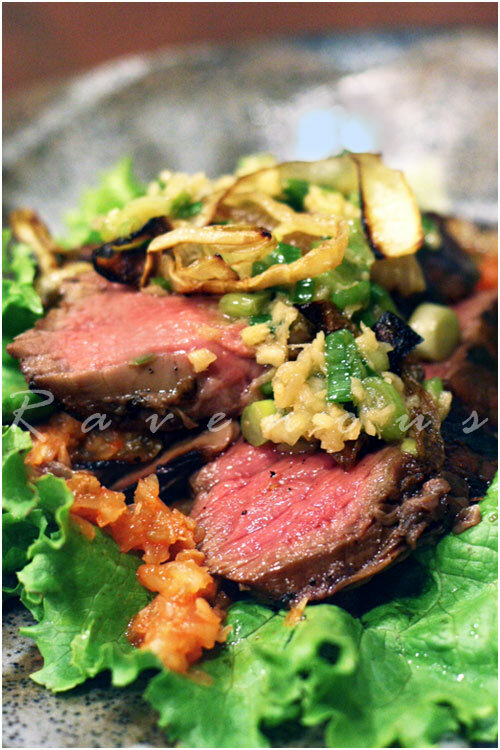 Jackie: The marinade itself was solid, but the overall flavors and style of the ssam is a great way to eat steak. jessica: we didn't know that and don't follow him that closely other then to know he's a bit controversial–and perhaps that's one reason for his notoriety as well. 3 hungry tummies: all thanks to Kim future bro in law! This dish look fabulous! I'm enticed by all of the garlic and tangy flavors of the kimchee. I'm very curious about how the pork buns turned out. I adore his pork buns. The next time you guys are out in NYC, try Ippudo's, the ramen and porks buns rival Momofuku's! Fresh Local and Best: Thanks! We're itching to go back to NYC one day so we'll definitely have to email you for some suggestions if we do. HoustonWok: Nothing wrong with our bo luc lac again! But ssam is really great way to eat steak as well. Apple juice/cider is often used to brine pork chops or turkey so it's not a suprise he used it for steaks. Looks great! Thanks for posting this, as I've had Momofuku on my mind lately! ( I'm psyched for the book.) The perilla leaf is such a great touch, and your steak looks cooked perfectly! Connie: Thanks! We love perilla and it's spicy notes really enhance the steak. Looks like a REALLY missed out on this weekend's dinner party! Say you'll do it again? Pretty please? gastronomer: it would have been great to have you guys around since you and vern would be the only ones to have eatened there! Next time for sure! The salad looks fantastic. I have never made steaks at home. Maybe it's now time to try it…;)! 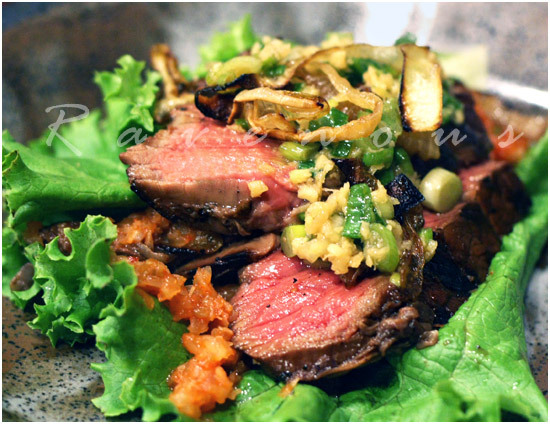 Cooking Gallery: If you don't have a grill, try our bo luc lac (vietnamese shaking beef) recipe! Your dish looks absolutely enticing. Juicy steak and fresh condiments. I am drooling all over my keyboard. Tuty: Thanks! 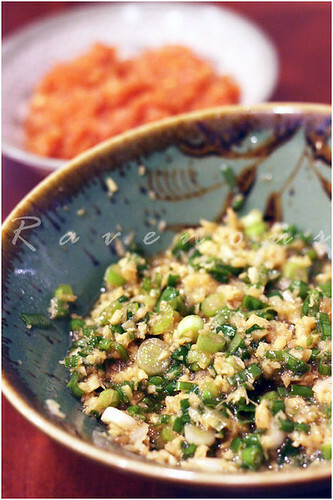 the ginger scallion sauce was great–reminds us of the ginger sauce used in Hainanese chicken. That's a very juice steak with a very flavorful sauce. It's lively. I saw this post on Friday afternoon whilst at work and I was literally drooling at my desk! Inspired me to cook steak last night!